In 2013, we pass two particularly important milestones for education in the Commonwealth: the Association of Commonwealth Universities (ACU) celebrates its Centenary, and the Commonwealth of Learning (COL) its Silver Jubilee. Commonwealth has made a distinctive contribution, and that the work of both the ACU and COL continues to be of outstanding value. The practical impact of their respective endeavours in the field of education advances our shared values of democracy, development and respect for diversity, and reinforces the sense of the distinct Commonwealth identity and the spirit and benefit of mutual support. Meeting in Mauritius last year, Commonwealth Education Ministers acknowledged that, ‘despite the significant increase of access to education, quality and equity represented common challenges across all Commonwealth countries’. Addressing the meeting, the Prime Minister of Saint Lucia, Dr Kenny Anthony, quoted the observation of his fellow St Lucian, the Nobel Laureate economist Sir Arthur Lewis, that ‘the fundamental cure of poverty is not money, but education’. In their communiqué, ministers went on to note that, ‘unless robust advocacy for the pivotal role of education post-2015 – in the economy, for society, for democracy and for development – is made, there is a risk that it might lose its place in the global priorities’. 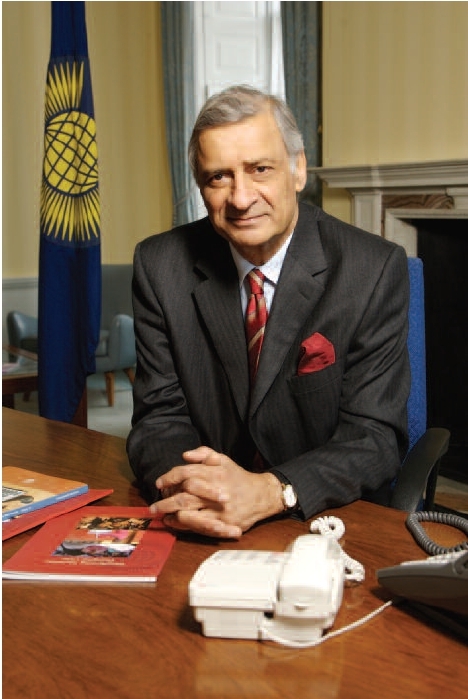 It was therefore with a great sense of urgency and collective responsibility that a Ministerial Working Group was established, with representation from all regions of the Commonwealth, to define Commonwealth priorities for education within the global development framework that will succeed the Millennium Development Goals (MDGs) and the Education For All (EFA) targets post-2015. Following a process of consultation, and a meeting at Marlborough House in December 2012, the Group’s recommendations concerning education on behalf of the Commonwealth were advanced through UK Prime Minister David Cameron, Co-Chair of the UN Secretary-General’s High Level Panel advising on the global development framework beyond 2015. We received clear confirmation that this Commonwealth contribution helped practically to shape the global discourse on the post-2015 world we want. The essential link between education and development is especially apparent in the sphere of youth livelihoods, employment and school-to-work transitions, which are discussed in this publication. It also finds reflection in our Commonwealth theme for this year, ‘Opportunity through Enterprise’: both are advanced through early and sustained access to education and through lifelong opportunities for employment, economic inclusion and personal fulfilment. Greater participation by young people in the social and economic life of communities and the nurturing of civic leadership through respect and understanding are goals of the Commonwealth Youth Programme (CYP). It too reaches a landmark in 2013, the 40th Anniversary of its establishment in accordance with a mandate of Commonwealth Youth Ministers, endorsed in 1973 by the Commonwealth Heads of Government Meeting in Ottawa. In remaining relevant, the CYP is now being reformed so that it continues to serve contemporary youth development needs in the years aheadThese deep roots and continuing initiatives to advance education and entrepreneurship among Commonwealth citizens, particularly the young, show the benefits that accrue as a result of collective practical action and co-operation among our member states and within the Commonwealth family. Notable among recent developments was the founding in 2012 of a Commonwealth Students’ Association (CSA), followed by the launch in 2013 of its new website and a membership recruitment drive. The CSA will represent and build the capacity of student associations and their leaders, undertake research, and provide a conduit for consultation and advocacy on matters of particular concern to students. The title of this publication, Commonwealth Education Partnerships 2013/14, underscores that realising the potential of collaboration remains central to the way we work in the Commonwealth. The Commonwealth Secretariat is partnering in a project linked to the 2014 Commonwealth Games in Glasgow: ‘Commonwealth Class’ will use the interest raised by preparations for the Games as a focus for creating pan-Commonwealth links between children, teachers and schools throughout the Commonwealth. Our aim for this global online initiative is to invigorate learning and to bring into the classroom the values of the new Charter of the Commonwealth and the aspirations we have for the increasingly youthful Commonwealth. By providing material for school assemblies and printed classroom resource packs for those working with the 7-14 age group, our intent is that within the context of sport these values will be given added vitality in schools, taken home and communicated to friends and family. This project can become a striking resource, helping motivate our youth to high achievement, and deepening their sense of belonging to the Commonwealth family. We at the Commonwealth Secretariat value the fruitful relationship we enjoy with Nexus Strategic Partnerships, who work closely with us and the wider Commonwealth family to produce this and other publications. By bringing together a broad cross-section of education activities in one publication, Commonwealth Education Partnerships 2013/14gives a sense of the immense range and the vitality of co-operation made possible through the links and resources of our contemporary global Commonwealth networks. We are confident that even more can be achieved through these connections, and that Commonwealth collaboration in pursuit of our collective goals can be enhanced by means of the additional resources and capabilities for advanced interaction now available through ‘Commonwealth Connects’, our ambitious web platform. By working together inclusively, we are able to achieve more and to build innovatively on each other’s participation and strengths.